A group of researchers from Aalto University in Finland and Sun Yat-sen University in China provide a standardized approach to improve the accuracy and reliability of contact angle measurements of surfaces. Knowing how surface materials interact with liquids is crucial to everything from printing to recovering oil spills from water. Being able to accurately and reliably analyse the minute details of wetting—that is, how a liquid adheres to or slides from a given surface material—is key in designing materials in many branches of industry. In their paper published in Nature Protocols, researchers from Aalto University and Sun Yat-sen University present a rigorous methodology for measuring wetting. They propose it as a universal procedure for the research community to obtain reliable data, allowing comparison between research groups to promote the development of new wetting materials. 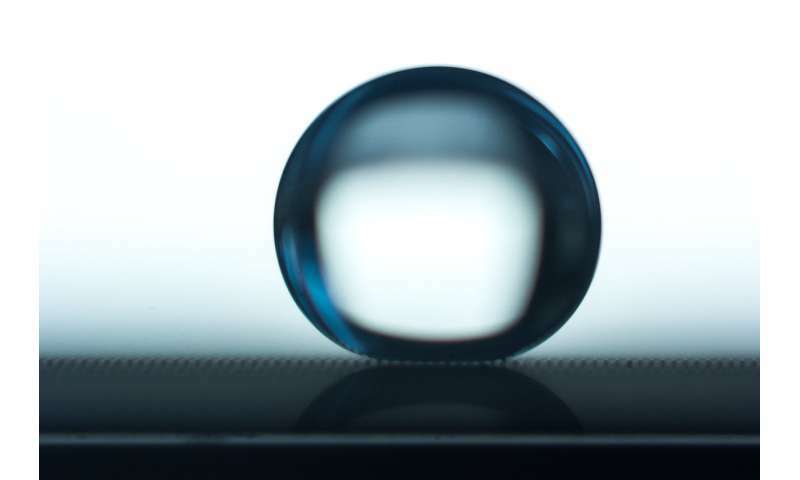 The most common way to study wetting is by measuring the shape of a droplet, in particular the contact angle between a solid surface and a drop of liquid, as they come into contact. This method was originally developed in 1805 by Thomas Young. A low contact angle means the liquid will spread and adhere to the surface; a high contact angle, in contrast, means that the surface will repel the liquid. A contact angle measurement may seem deceivingly simple to carry out, but it is demanding for researchers to obtain meaningful and reliable data. Real surfaces cannot be properly described by a single value of a static contact angle, save perhaps cases where the solid is atomically smooth and free of chemical impurities. The actual conditions for which materials are designed rarely meet such requirements, though. "What we need to do instead is to measure a pair of advancing and receding contact angles of a droplet that grows and shrinks on a surface. Many publications on wetting, however, still report only a single value of a static contact angle, and therefore lack accuracy and reliability when explaining how the liquid actually behaves on the surface," says Tommi Huhtamäki, doctoral student and principal author of the work. "We are surrounded by vital materials whose wetting properties need to be designed with precision. Contact angles are evaluated in performance and durability tests of materials all the way from buildings and airplanes to blood test devices. It is crucial that we are able to conduct research based on shared and reliable standards," says Robin Ras, Professor at Aalto University.